Imagine you’re walking your dog, lakeside, in wintertime and you see a strange dog wander out onto the ice and fall through. Would you scream for help? Call 911? Or would you march straight into the water, breaking the icy crust as you went, to rescue the dog before hypothermia set in? This Vancouver woman went with C in a resounding manner. 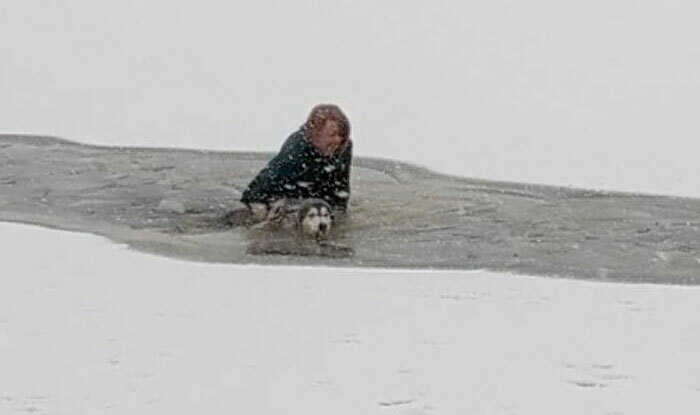 Area resident Ben West was walking his pup in the park when he noticed another dog out on the ice of the frozen lake. A moment later, the ice gave way and the dog fell in. It was unable to get itself up and out, and quite far from the shoreline. Other onlookers called and encouraged, trying to coax the dog out. Then one woman decided to take matters into her own hands, heading out into the lake and breaking the ice as she went. She was waist-deep by the time she reached the dog, her winter garb doubtless heavy and waterlogged. Holding onto the animal, she trudged back out the way she’d gone in. By the time she reached the shore, paramedics, who had been called by those waiting, were ready with blankets. West never got the woman’s name, but said she was calm throughout the ordeal. The dog, post-toweling, was back to playing with the other dogs in the park, no worse for wear.